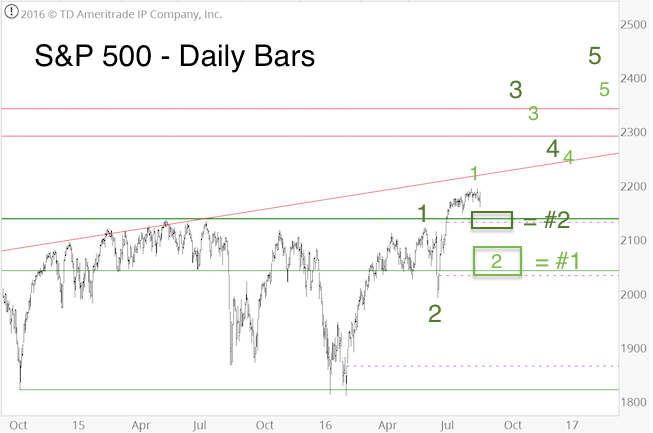 The last free update (March 2: S&P 500 Reaches Up Side Target – Now What?) pointed out that the S&P 500 reached our up side target, and that risk of a pullback is increasing. Since March 1, the S&P lost as much as 79 points, the largest drop since last October (followed by a 50-point snap-back rally). Is the correction already over, or are stocks ‘re-loading’ for the next leg down? As it turns out, the S&P ran out of fuel at 2,401, not 2,405. Based on the market’s strength, and momentum leading up to the 2,401 high, a drop into the mid 2,200s would be deeper than expected (but a good buying opportunity if it happens). Are there other down side targets? 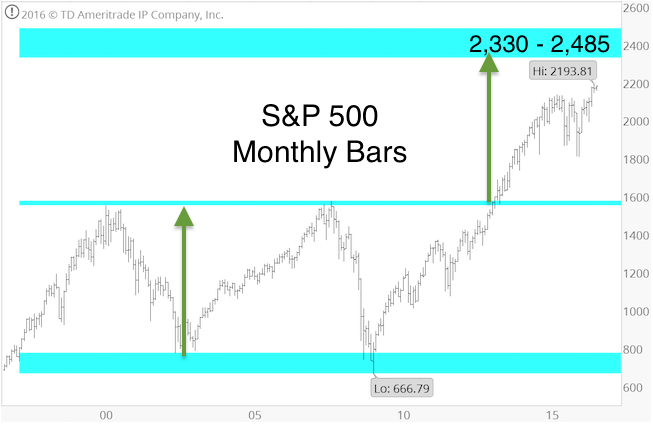 The March 26 Profit Radar Report pointed out that the S&P 500 is about to reach the minimum down side target around 2,326 (this was based on Sunday’s overnight selloff), and recommended to buy Monday’s gap down open (which ended up being at 2,329). Because the S&P 500 reached the minimum down side target, was oversold and showed bullish divergences at Monday’s intraday low (Sunday night’s new low in S&P futures also showed a bullish divergence). A bounce was highly likely. We just didn’t know how big of a bounce it will be. Although another low sometime in April would fit best, it is not necessary. The chart below plots the summer 2016 correction against what we’ve seen this far for a potential template. The recommendation to at 2,329 on Monday was given to provide peace of mind in case stocks continue higher (like they’ve done most of the past eight years). If the S&P 500 does not fall to new lows in April, we are already long. If the S&P 500 does drop to new lows, we will be able to buy at lower prices (and ideally sell our long position for a profit or stop out at breakeven to avoid any losses). We will monitor various breadth and sentiment measures along with technical resistance levels to help determine if/when stocks will relapse. Buying at lows – although they may prove temporary – eliminates FOMO (Fear Of Missing Out) and the perceived associated need to chase after price. The next few months will likely increase the need for FOMO trades, as we expect some big moves and hope not to be left behind. The Profit Radar Report’s 2017 S&P 500 Forecast and twice-a-week regular updates provide short, mid-and long-term forecasts based on various key indicators. On Monday, February 27, the Dow Jones Industrial Average (DJIA) recorded its 12th consecutive up day. This is the second longest such streak since 1930 (the longest run was 13 days in January 1987). The S&P 500 hasn’t dropped more than 1% a day for 104 trading days. The record gains haven’t gone unnoticed. Many sentiment indicators are in uber-bullish (bearish for stocks territory). The investment advisors and newsletter-writing colleagues polled by Investors Intelligence are more bullish (63.10%) now than at any other time since 1987. This tumultuous span includes the 2000 tech bubble and the 2007 leverage bubble tops. The Relative Strength Index (RSI-14) finished February above 70 on the daily, weekly and monthly chart. However, trading volume has been suspiciously low. Despite solid gains, less than 40% of NYSE volume has been flowing into advancing stocks. Record optimism and strong gains on low volume … anyone with a bearish disposition could (ab)use those facts to paint a pretty bearish picture. However, history cautions against that. Several times throughout the post-2009 bull market – and most recently on December 14, 2016 – the Profit Radar Report pointed out that historically stocks rarely ever top on peak momentum. The February all-time highs occurred on peak momentum. The green vertical lines (chart below) mark previous peak momentum (based on RSI-35) highs. None of them market major tops. 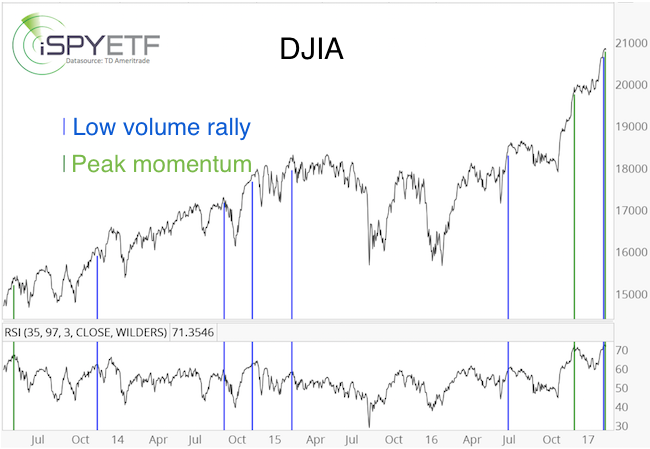 The blue lines mark strong rallies to new all-time highs on low volume (less than 40% of NYSE volume flowing into advancing stocks). Most of those instances were followed by corrective pullbacks, but nothing worse. Sometimes stocks simply push the envelope and plow higher than anyone thought possible (the S&P 500 already surpassed the 2017 year-end targets analysts set in December). The August 28, 2016 Profit Radar Report outlined why to expect such ‘abnormal’ gains. Although the risk of a temporary pullback is increasing, the body of evidence points towards further gains in the months to come. The historic Dow Jones winning streak is unlikely to be followed by a “thud”. Any correction should be viewed as a buying opportunity. Visual forward projections (published back in August, but still valid today) and up side targets are available here: S&P 500 Update – Expect the Abnormal. In fact, the up side targets given in August have been reached. Now what? 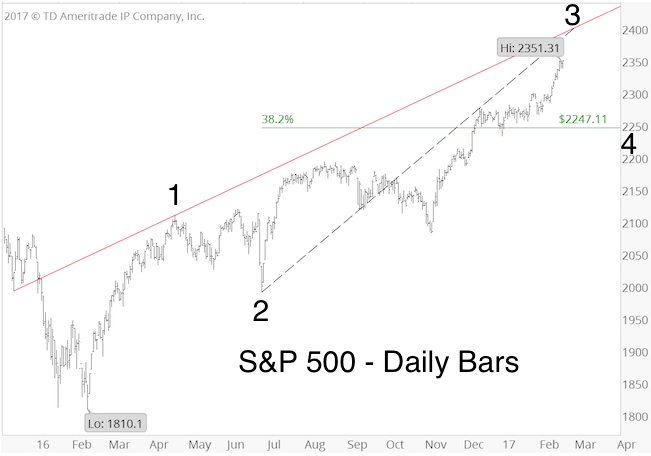 Here is the latest update: S&P 500 Reaches Up Side Target – Now What? 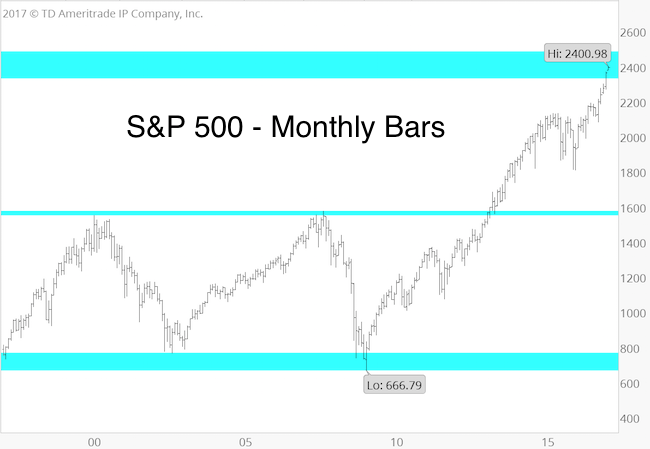 The S&P 500 has reached the up side target zone highlighted in February and August/September 2016. Now what? Since the wave 2 pullback was on the shallow side, the dark green Elliott Wave Theory count (with wave 3 target around 2,390) became operative. As the updated symmetry chart shows, “we are here!” Now what? Stocks are at peak momentum (35-day RSI is at the highest level in 20+ years). 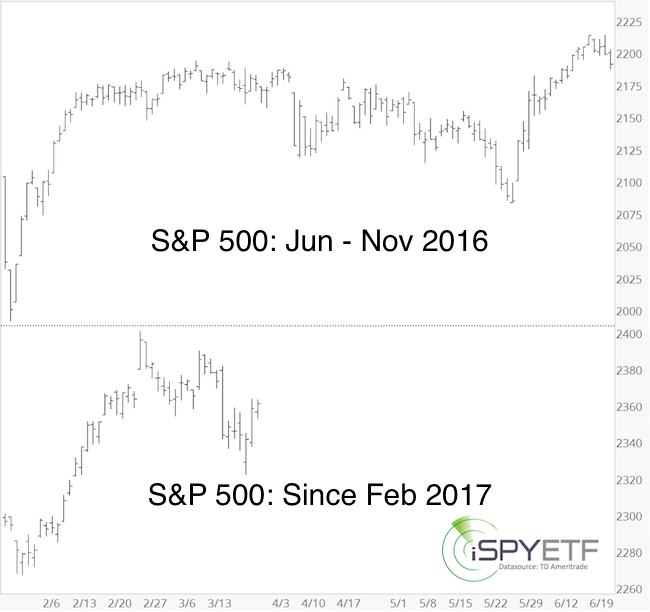 As the Profit Radar Report highlighted many times in the past (most recently on December 14), stocks rarely ever top at peak momentum. This means, we are not at a major market top. But the risk of a pullback is increasing. 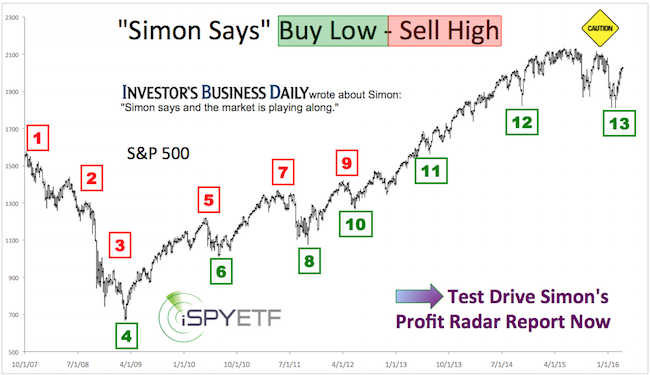 The latest Profit Radar Report shows the most likely spot for a pullback, along with the scope of any pullback.